The son of Dutch immigrant parents, William Hendriksen (1900-1982) obtained his BA at Calvin College and went on to earn a doctorate from Princeton Seminary. In the early 1940’s, he was appointed Professor of New Testament at Calvin Theological Seminary, where he served for nine years before returning to full-time pastoral work. He is remembered both for his scholarly commentaries as well as for his 1939 book, More Than Conquerors: An Interpretation of the Book of Revelation. 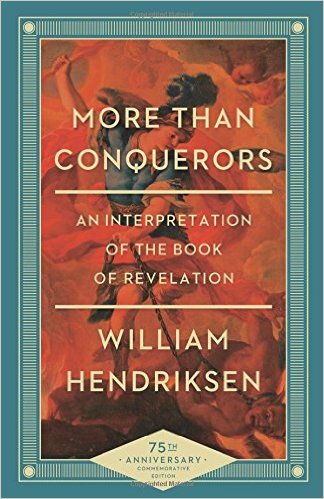 In the 75th anniversary commemorative edition of More Than Conquerors, the included biographical tribute shares with readers that Hendriksen was a disciplined and prolific writer who could read in twenty(!) different languages and worked on his biblical commentaries even into his final years (p.8). Hendriksen wrote More Than Conquerors from both within the Reformed tradition and as a member of the amillenial camp. The term “amillenial” basically means that he viewed the emphasis of Revelation as spanning from Christ’s ascension all of the way to His second coming at the end of the age, rather than being solely concerned with far off, future events. More specifically, amillenial interpreters view the millennium spoken of in Revelation ch. 20 as being symbolic for the period of the church age, rather than a literal one thousand year period still yet to come. There are certain moments where Hendriksen’s language feels a bit dated, and readers who aren’t of a particularly Reformed persuasion will probably find themselves differing with some parts of his interpretations, but that’s alright. I firmly support reading across traditions, both in order to find unexpected common ground and to more fairly represent the views of other theological camps. *Disclosure: I received this book free from Baker Books through the Baker Books Bloggers http://www.bakerbooks.com/bakerbooksbloggers program. The opinions I have expressed are my own, and I was not required to write a positive review. I am disclosing this in accordance with the Federal Trade Commission’s 16 CFR, Part 255 http://www.access.gpo.gov/nara/cfr/waisidx_03/16cfr255_03.html. This entry was posted in Book Reviews and tagged Amillenialism, Apocalyptic, Book Reviews, Revelation, theology, William Hendriksen by joecrow91. Bookmark the permalink. True. I wish everyone did this.